Universal monitor riser frees up valuable space on your desk, table or workstation by placing your monitor from up to 5-1/4" above the surface. Use the included short and long leg segments to create a height that's comfortable for you to help ease eye and neck strain. Plus, its multipurpose design is also great for laptops and printers. 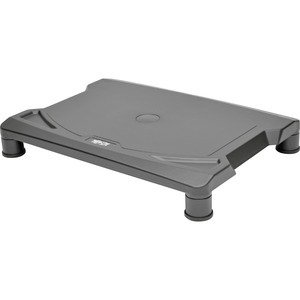 The riser's extra-large platform safely supports up to 40 lb. Rubber feet secure the riser in place on smooth surfaces to prevent sliding. Easy-to-use design assembles in just a few seconds for quick, simple use.